This exhibition has been extended into late January by popular demand and if things go on the way they are, will probably be extended again. It has already attracted 16,000 visitors to Matera, the European Capital of Culture 2019. Held at the city’s MUSMA museum, the exhibition documents the 50th anniversary of the making of Pasolini’s film Il Vangelo Secondo Matteo about the life of Christ and recently described as “the best film on the life of Jesus ever made” by the Osservatore Romano. It was filmed in Matera, which Pasolini turned into his version of Jerusalem. Pasolini was a film director, artist, poet, actor, writer and journalist. He was also anti-establishment, anti-church and gay. The film’s subject matter in this context became highly controversial as did the choice of Matera, at the time a city with appalling living conditions deemed a national disgrace. The Catholic Church was outraged and critical opinion divided when the film launched at the 1964 Venice Film Festival. The exhibition is divided into six sections, one dedicated entirely to Matera. There are interviews, film clips, photos, documents and art works including sculptures and paintings. 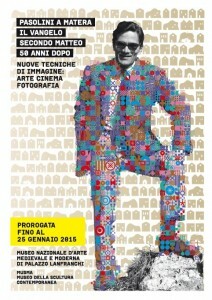 In an exhibition documenting what is considered by many to be Pasolini’s greatest work, Matera is at centre stage. Seeing how desperately poor the city was half a century ago makes its current spectacular renaissance all the more remarkable.